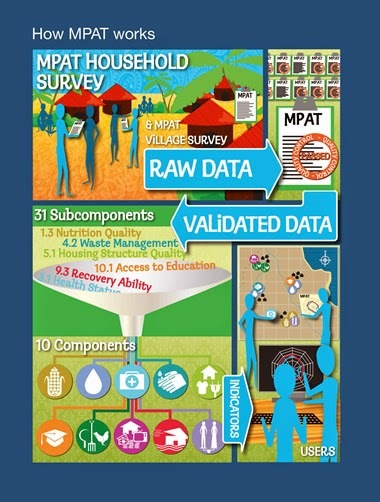 Today we launch Multidimensional Poverty Assessment Tool (MPAT) - your "rural poverty dashboard"
Want to find out how to assess and address the various dimensions of rural poverty? Interested in knowing how to map rural poverty and measure the impact of rural development projects? Tune in on 3 April at 3:00pm CET to find out about IFAD’s Multidimensional Poverty Assessment tool (MPAT) - your "rural poverty dashboard". Our journey to develop this tool for development practitioners was made possible thanks to the Innovation Mainstreaming Initiative (IMI) - a DFID-funded initiative. And we cannot be grateful enough for this generous contribution, as the IMI has allowed us to launch and mainstream numerous groundbreaking and innovative initiatives. This morning driving to work, it occurred to me that we may be able to link MPAT, is a tool designed to help development practitioners to take a snapshot of rural poverty by collecting people's ideas, with SenseMaking, a methodology that Dave Snowden shared at the Failfaire - another IMI sponsored initiative. If you are into psychology, you can probably find similarities with Maslow's hierarchy of needs? We at IFAD put PEOPLE at the centre of our work. So if you are an advocate of bottom-up approaches, MPAT is your tool, as it allows you to document people's perspectives both a household and village level and map these out. You can find out more about this tool on our website. Make sure you follow us live on 3 April at 3pm CET via webcast or on Twitter by following #ifadmpat. Hope to see many of you virtually and before signing off, check out Thomas Rath's piece on Sustainable rural development needs a roadmap.